Additional age relaxations of 10 years are applicable for Physically Challenged Persons (PwD / PH) along with the above age relaxations. Those who applied for the post of Veterinary Assistant vide notification dated 14.08.2015 and 15.09.2015, need not apply again. Their Application Form is valid for this recruitment. Hence, whoever not applied earlier only, requested to apply now. Application Forms are available District Head Offices of DAHVS. 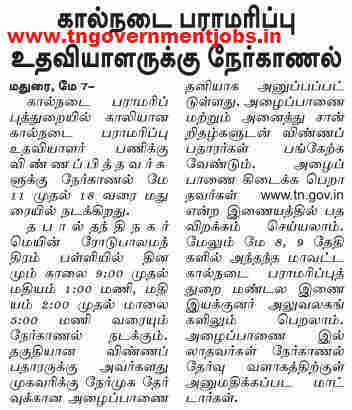 Cost of application form is Rs.10. 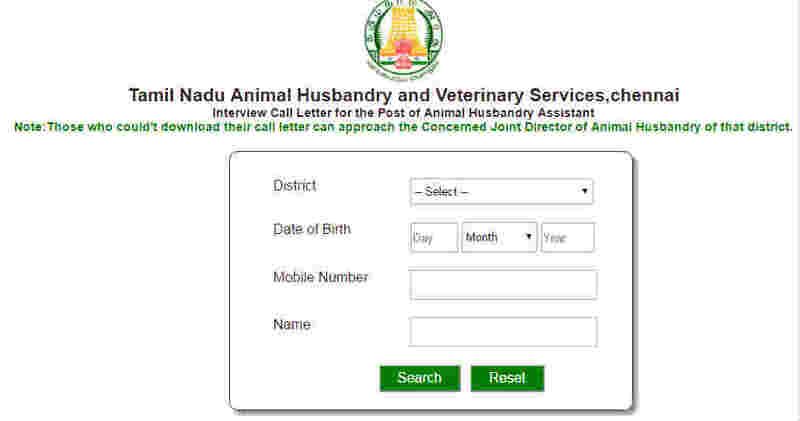 Application Registration Fee Rs.100 (one hundred only) can be paid through Axis Bank by Challan or by Demand Draft in favour of "Director, Animal Husbandry and Veterinary Services Chennai 600 006." 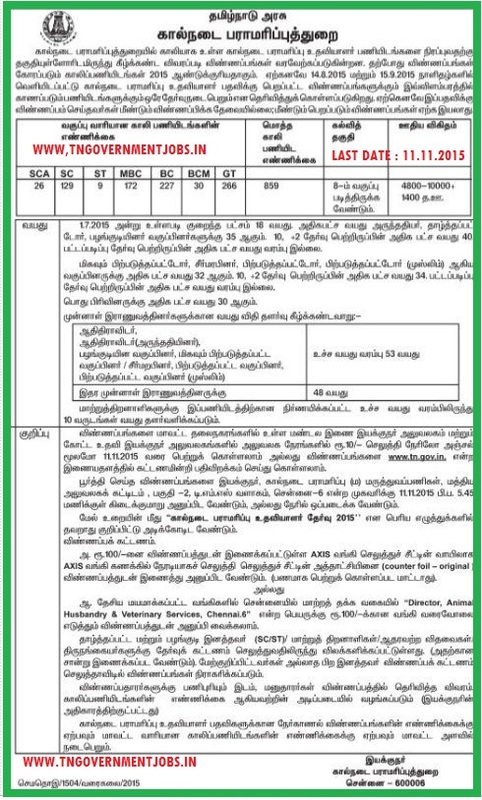 payable at "Chennai"
Duly filled application form along with all necessary documents (duly self attested) to The Director, Animal Husbandry and Veterinary Services, Central Office Buildings, Block II, DMS Complex, Chennai 600 006 on or before 11th November, 2015. 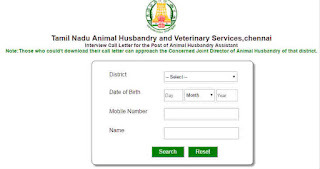 Application Cover (envelope) must be superscribed as "Veterinary Assistant Exam 2015"
Demand Draft (in favour of "Director, Animal Husbandry and Veterinary Services Chennai 600 006." payable at "Chennai") or Axis Bank Payment Challan Counter foil. Still the recruitment process is in hold by the dept. 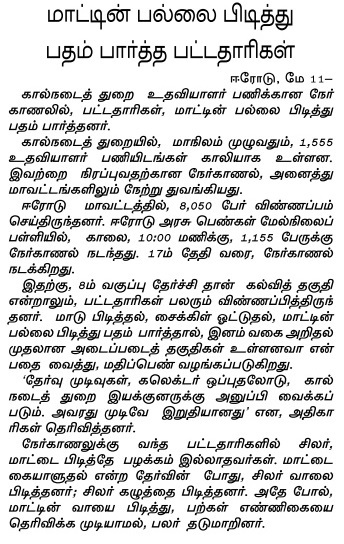 This kind of repeated media's news will give the 'Oxygen' to the in-active status. MY WIFE GOT INTERVIEW LETTER... BUT NOT INTERESTED TO GO.. I'm already applied this 2 posting.but still now i'm not received any call later. my application reject or accepted pls Released application reject list and select list. 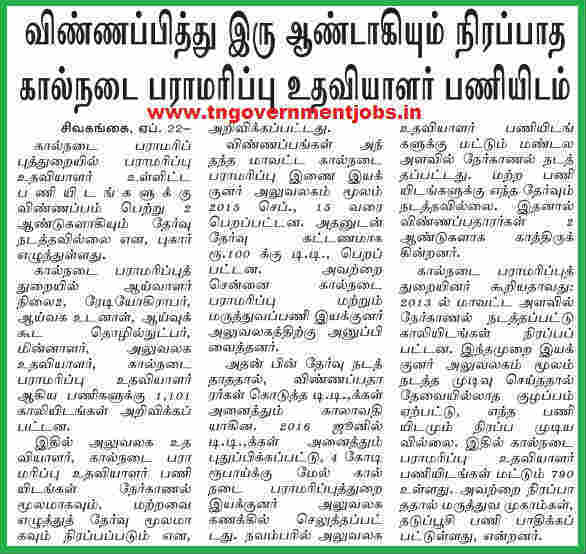 உடனடியாக புது அறிவிப்பு வெளியிடப்படுமா. 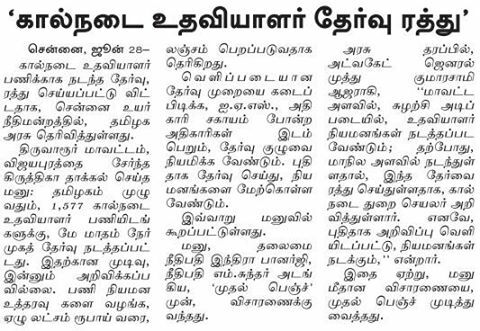 எப்போது வெளியிடப்படும்.